I love to watch Ted videos, the amazing variety of stories, of ideas, and of people – many like you and me with something to share. Sometimes one clicks, just makes me say “WOWWW”…my mind jumping out of my chair and all my little electrons and neutrons doing that “woot, woot, woot” fist pump thing. I hope some of you are still out there, or you’ll perhaps find this when you need it, and maybe someone else will do the wave with me. If not, that’s ok too. Writing is cathartic in so many ways. When I was young, I thought I’d know it all by now, have everything figured out. The older I grow, the less I feel I do. That’s not a bad thing. I have a good amount of lifetime to look back on, to realize why I do the things I do, why I react the way that I do, why I draw certain situations around me…and I can learn, evolve. Nothing should ever stay the same. Today’s Ted video is now one of my favorite. Luvvie Ajayi is an amazing speaker, funny, and right to the point. Staying in our comfort zone holds us back. Sure, we’ve all heard that a million times..but to embrace it, to believe it, to change it is so much harder than simply hearing the words once, twice, a hundred times. Nearly every day I realize that the brain will only accept what it’s ready to accept. Those “ohhhhh…now I understand” moments. Hearing it from others just really doesn’t do it. It’s that day our own mind comprehends it, the sky parts, the angels sing, and we finally see. How often do I not stand up for myself because of fear? How often do I hold myself back because of fear? Fear of trying something new, fear of failing, fear of being disliked, fear of the opinion of others. I think sometimes in the world of SL, it can be even worse in some ways than RL. People are quick to judge, quick to snap, quick to say harsh words and gossip. I know I too have been guilty of this. I also think SL can also be an amazing world of supportive people, who have seen me struggle and given me hope, and encouraging words, that everything will be alright, that things will pass, that there is something to learn from the pain. I hope that I have done the same for others. I’ve been quiet lately, because I’ve slowly been breaking out of my comfort zone, in tiny little pieces, looking deep inside myself. It creates some chaos doing this, but time and time again I see how much brighter the world is, how much happier it can be by pulling myself out of my comfort zone, not running back behind my “wall of safety”, and falling into the line of dominos, somewhere at the end where no one will notice me. 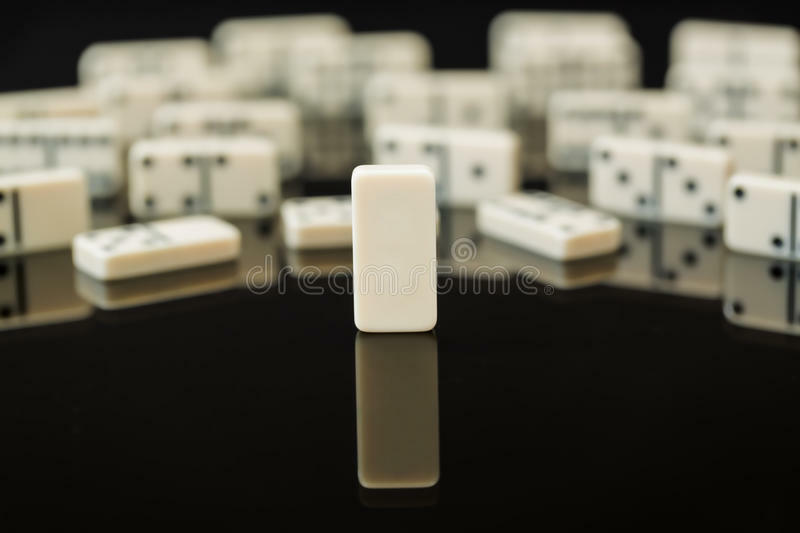 Within my life, I can BE the domino, the one that starts the chain, with the strength and the courage to do what I believe in, to stand up for myself and others when need be, and express myself in new ways. Perhaps her words will move you, too. As always, this is your life, and your freedom to make choices. My mantra: “Question Everything”. My theme song: “Try Everything“. Never apologize for who you are or what you believe in. Fear will always be there, leading you to question and doubt. Never let fear stop you from doing what’s right for you. I’d rather be a domino conga line of one, than to sacrifice myself and my beliefs.